Conventional Financing Available! Handyman Special! 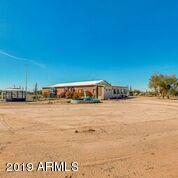 This is a 3.38AC Parcel with private well, entire fenced property that has a 1900 sq ft home built in 1987 and has just recently been re-assessed (JAN 2019) by Pinal Countyto a ''SFR'' - Single Family Residential, per Pinal County Assessor's Office. 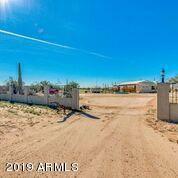 This horse property is very private with panoramic and mountain views, no HOA, has a one car attached garage & separate/detached garage for plenty of room to park your cars, RV, boat, toys,etc... and private well is located on site (well is registered w/ADWR). Home has 2 bedrooms with den/office, AZ Room, 2 bathrooms, eat-in kitchen, family room, and inside laundry room!The outdoor area has a fountain with gazebo! This property needs work and has great potential! Probate/Estate Sale.